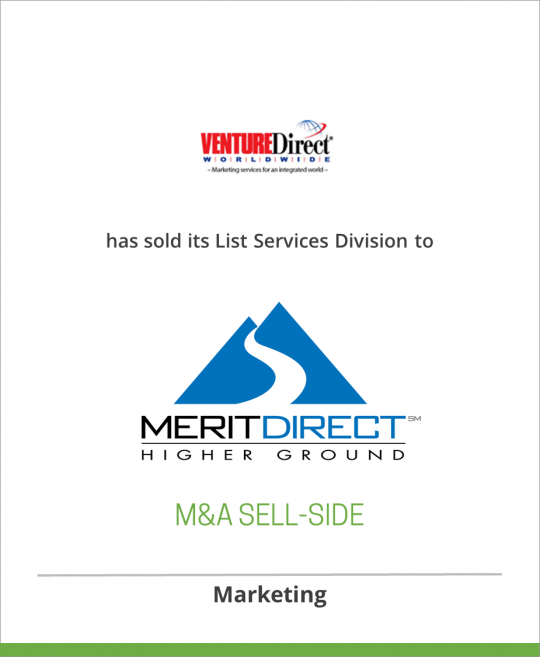 eSilva+Phillips announces that its client Venture Direct Worldwide, an advertising and list management firm, has sold its List Services Division to MeritDirect, a White Plains, NY based direct marketing agency. The List Services Division, which includes the Xactmail email and postal databases, provides a full range of list rental and list management services. MeritDirect is a recognized leader in the B2B and B2C direct marketing industry, offering marketers integrated marketing solutions with an array of products and services. Mailers and list owners achieve a superior return on their marketing investment through MeritDirect’s list brokerage, list management, customer list enhancement and optimization, marketing databases and interactive services.